Safe transportation of a person using a wheelchair or a stroller requires appropriate equipment and the knowledge as to how to use it. If possible, it is always best to transfer the person to the car seat and use the provided seatbelts. When transporting a person in a wheelchair/stroller, a headrest must be used. 1. A standardized 4-belt tie down system. 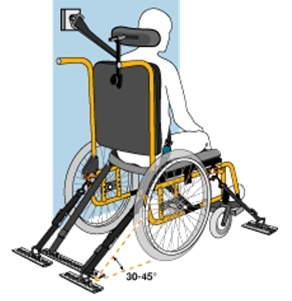 The belts connect to the wheelchair/stroller at their strongest points and cannot be attached to detachable parts, such as arm rests, wheels, or leg rests. See illustration below. 2. A standardized passenger belt connected to the chassis of the car. Internal belts of the wheelchair do not provide appropriate protection for passengers. In the event of an accident, they will disengage from the wheelchair. See illustration below. Wheelchair tie down systems need to be used with a reinforced base of the car, with tracks to connect the belts. Following are the two leading companies worldwide that provide standardized equipment.